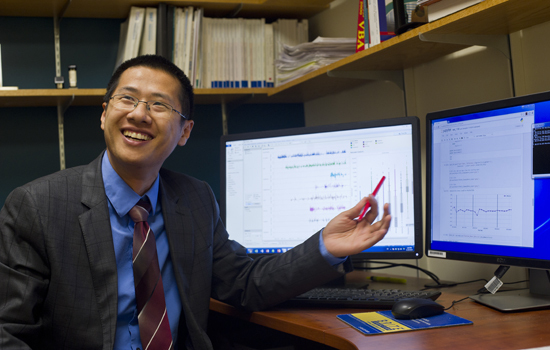 Yang Yu, assistant professor of management information systems at Saunders College of Business, conducts research in social media. He spent two years applying sentiment analysis to the Twitter feeds of NBA players. The NBA has more than 17.15 million Twitter followers—and one of the most ardent is Yang Yu. Yu, an assistant professor of management information systems at Saunders College of Business, spent two years (2013-2014) tracking Twitter feeds of nearly 350 NBA players. Applying social media analytics (SMA), his research reached this conclusion: Twitter sentiments expressed by NBA players may well predict how they play. “If players’ tweets on the day of the game are positive, they are more likely to play better than if their comments on Twitter are negative,” said Yu. The results of his study—“Hidden In-Game Intelligence in NBA Players’ Tweets”—done in collaboration with Chun-Keung (Stan) Hoi, RIT finance professor at Saunders College, and Chenyan Xu, computer science and information systems professor at Richard Stockton College of New Jersey—were published last November in Communications of the ACM. Using two parameters, Yu said the baseline model investigated the relationship between a player’s mood (24 hours before game) with his on-court performance (plus/minus) and found the coefficient was positive (0.17). In other words, if the players’ gameday tweets were more positive, they were more likely to play better. In the past few years, Yu said there’s been an explosion of tweets by NBA players who have used this social media tool, messages of 140 characters or less, to communicate with fans, journalists, peers, friends and others. He said sports analytics is growing, and the benefits of sentiment analysis—an emerging text-mining technique—are increasingly valuable for coaches and general managers. For example, the Dallas Mavericks have worked with Wayne Winston, a decision science professor from Indiana University who wields his analytics expertise to assist in on/off-court decisions made by the coaching staff. This is especially true for players earning higher salaries. On this list is Kevin Durant, of the NBA’s Oklahoma City Thunder and the league’s Most Valuable Player (2013-2014) who has more than 8.2 million followers on Twitter and has sent out more than 22,000 tweets. On Feb. 13, 2013, Durant posted the following message at 9:07 a.m: @DijahineedYa happy birthday shorty. Durant later contributed 18 points in an overwhelming victory against the New Orleans Pelicans with a high plus-minus (+31). As an example, James Harden of the Houston Rockets shared three optimistic tweets at 9:13 a.m., 9:14 a.m. and 2:15 p.m. on April 14, 2013—the earliest message reading, Happy Birthday Big Bro!!!! @Baron_Davis luv ya my G. Continue to inspire people. I’m one of them. Harden went on to score 29 points in a win against the Sacramento Kings, four points above his average for the year. Just the exact opposite happened in a tweet by Kobe Bryant at 5:12 p.m. on Feb. 10, 2013: @onepercentofone @pookeo9 exactly! That wasn’t cool and was ignorant on my part. I own it and learn from it and expect the same from others. Bryant had a remarkably low performance plus-minus score that night (-14) and the Los Angeles Lakers lost the game to Miami Heat. Yu said social media analytics is applicable to professional athletes in all kinds of sports. He recently completed a collaborative study on the “World Cup 2014 in the Twitter World,” which was published in Elsevier Journal, February 2015. If a player’s tweets on the day of the game are positive, he is more likely to play better than if his comments on Twitter are negative. Coaches and general managers can use the data to address players’ moods before games and determine game-day strategy. “The Future of Technology, the Arts and Design,” a futurists symposium, takes place at 11 a.m. April 27 during Imagine RIT: Creativity and Innovation Festival. Four RIT alumni will share their visions of the future as it relates to RIT’s core disciplines.